Sir Alec Guiness in the first photo with the young lad who played Oliver in original ‘Oliver Twist’ . Like you I find the faces familiar – you may have to think of the film first then look at the credits ! Thanks, yes I recognise him now sitting on the back of the Jeep with the hat and the young lad. Oliver Twist came out in 1948, probably the same year as these photos were taken. My Mum and Dad used to be Stewards at these events. 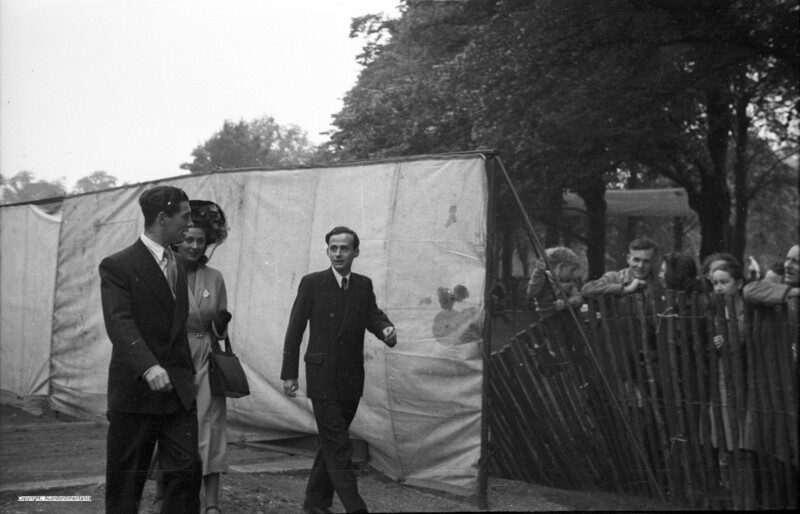 They also used to attend the childrens’ parties in the same park that Mr Hatfield (the then owner of the site) used to hold when they were younger. It is a shame that they have both passed away as they would probably have been able to give you the names of most of these stars. They both had close associations with this place, and that is why I have planted a horse chestnut tree to their memory. It is a wonderful park, and I often wander round it thinking of them and the events that used to be held there. Hi Jan, it is a wonderful park. 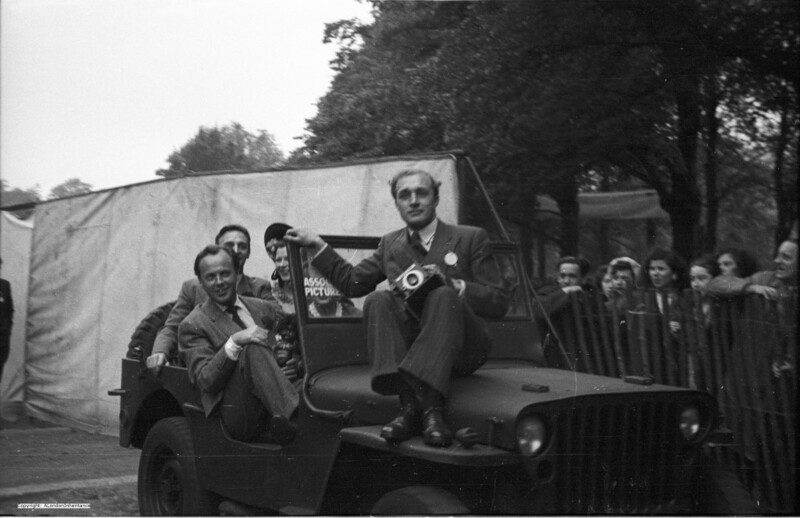 I have been able to identify Sir Alec Guiness in the first photo on the rear of the jeep with John Howard Davies the child actor who played Oliver. 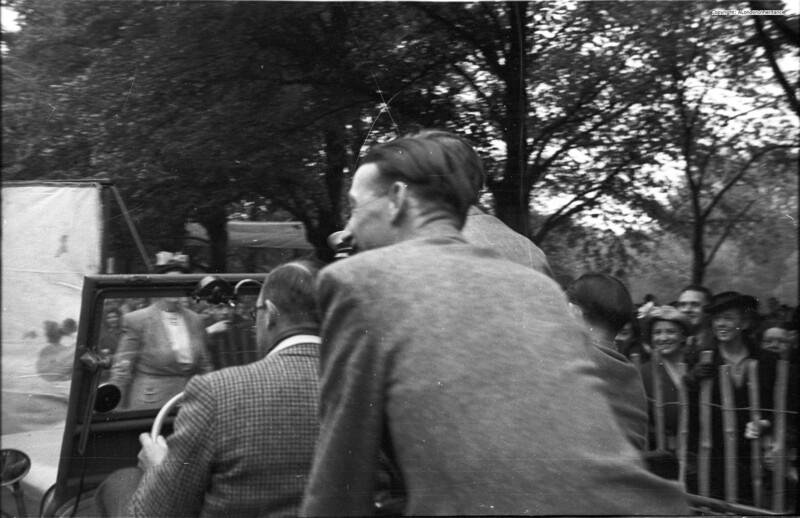 Oliver came out in 1948 so I suspect these photos were taken that year or soon after. Hi Author, yes unfortunately they were the only 2 I could pick out, but as someone had already named them I didn’t bother. Good luck with identifying the rest. It’s made me curious now. If I find anything out I will get back to you. 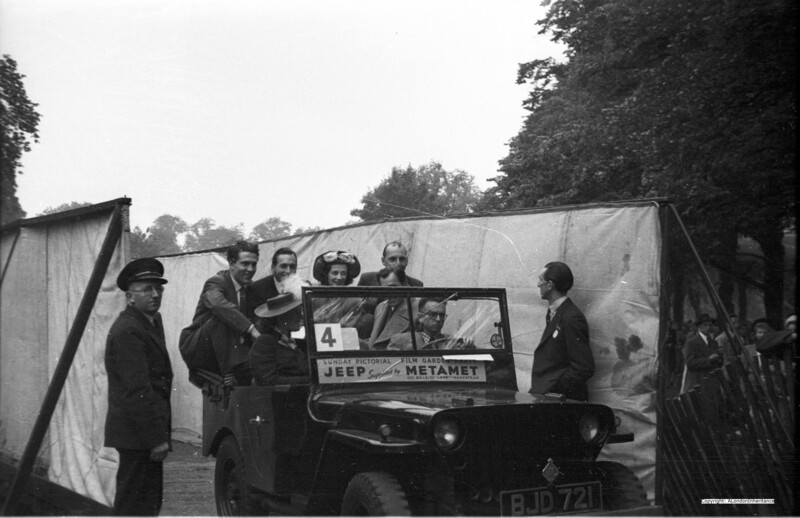 Dear Author, after a bit of investigating, I’ve confirmed my suspicion that in the front seat of jeep 2 is Michael Dennison, with possibly Stephen Murray and Patricia Plunkett sitting behind him. A lot of the other faces are really familiar. I will continue the case and get back to you with any other possibilities. 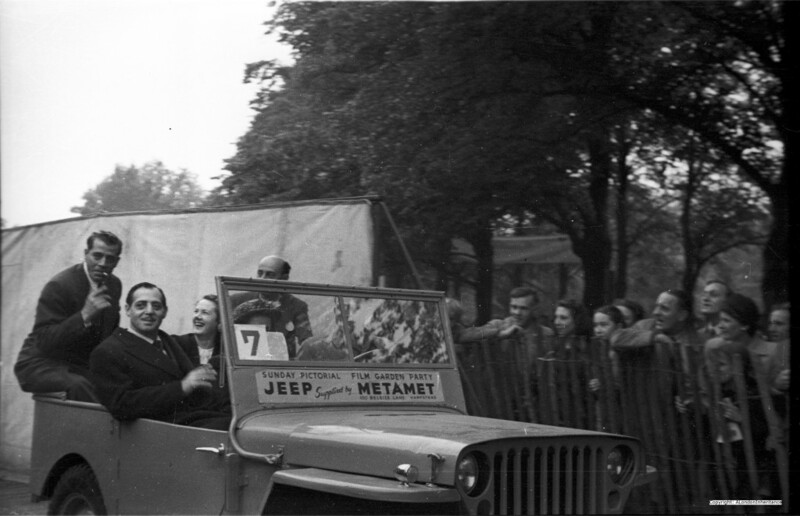 Hi David, the man you are talking about in the front of the last jeep looks familiar because I think it looks a lot like Raul Julia from the Addams family. But it can’t be him because he’s way too young, still the resemblance is amazing. I did wonder if it might be a Fairbanks but I can’t make it fit to any of them. I will carry on looking in to it for you and get back to you with any more answers. I’m enjoying being a ‘sleuth’! Hi Jan, yes, suspect you are right about Raul Julia, the resemblance is remarkable and it was probably why I thought I recognised him. Thanks for picking out Patricia Roc. That is 3 from that Jeep !! Hi Author, I’ve been going through my Mum and Dads 1948 programme, steward tags, tickets and the newspaper spreads they kept from The Sunday Pictorial 11-7-1948 (the day after the party). Some wonderful pictures of a lot of the big stars that were there on the day, Margaret Lockwood, Jean Simmons, Ingred Bergman, Anna Neagle, Michael Wilding, Jack Warner, Dennis Price, Jean Kent and John Mills to name but a few. 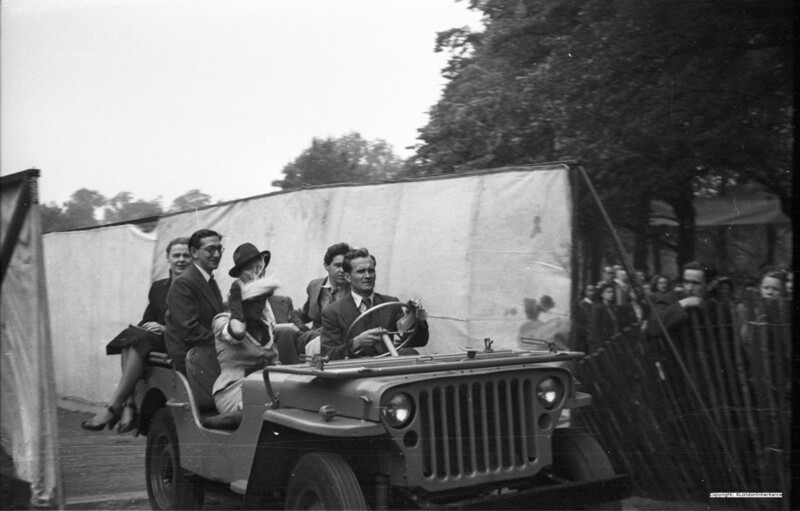 And a lovely picture of John Howard Davies (jeep 1) who played Oliver, being picked up by Francis L. Sullivan who played the beagle in the film, looking a lot more friendly than their characters were. 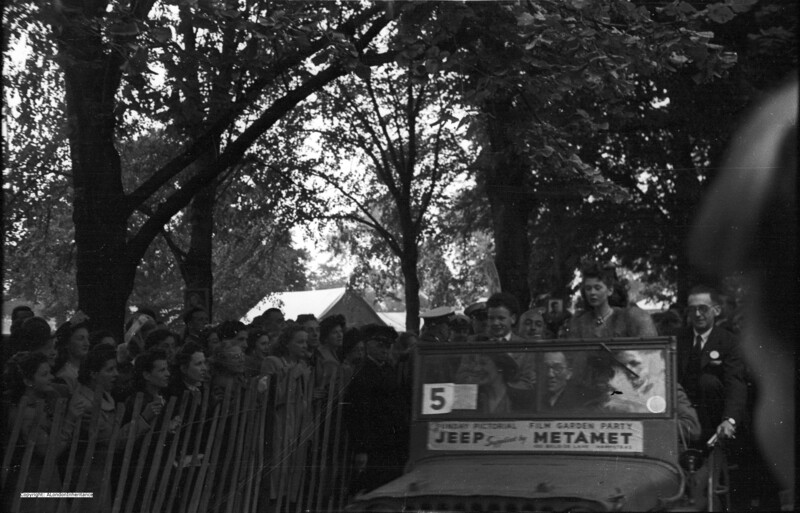 The only other star I can definitely identify in your pics at this time is in jeep 1, the lady with the dog is Patricia Roc with her pet peke. Will get back to you with any more info if I get it. Oliver Twist in David Lean’s film and Alec guinness who played Fagin. 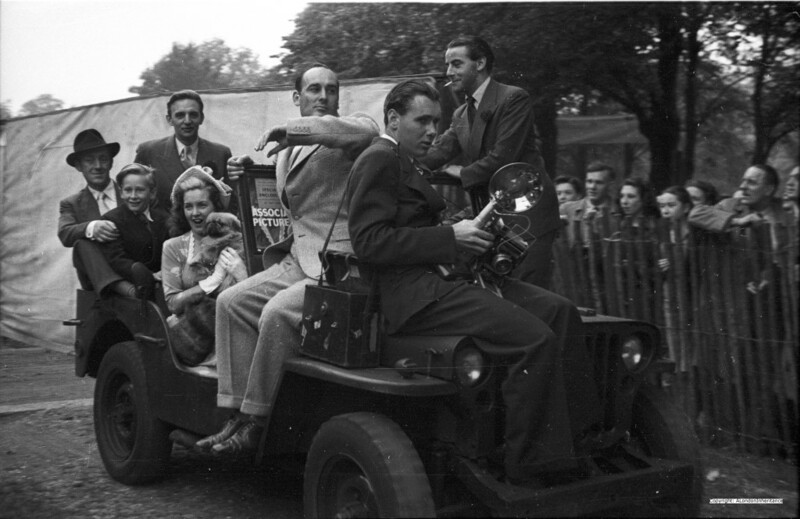 David Lean next to him. I’ve enjoyed reading your posts very much. Tracy, thanks for the information. I have since the post been able to identify Patricia Roc, John Howard Davies and Alec Guinness, but Derek Farr, David Farrar and Jack Lar Rue are new names. Thanks for filling in the gaps. Hi David, so glad you were able to fill in so many of the blank names. It’s very frustrating for me as Mum and Dad would probably have been able to name them all. Wonder if they’re looking down on us chuckling?!? Hi Jan, I agree, wish my Dad had written down the names on the photos after he had taken them, but it has been fascinating seeing them identified. I attended the Garden Parties in 1950 and 1951. I have an autograph book with signatures of quite a few of the stars mentioned. Including Sheila Sim,David Farrar, Yolande Donlan, Griffith Jones, Chili Bouchere, Rene Ray, Hubert Gregg, Beatrice Campbell, Michael Dennison, Dulcie Gray,. I travelled to London by train from Port a Talbot in S Wales with a friend. We had a wonderful time.